I have no interest in whether eggplant is male or female. I know there are those who have discussed this ad nauseam claiming that male eggplant is far less bitter than the female variety because it has less seeds. A male eggplant, according to eggplant experts, has a round, small flower end while the female is less round and smooth. So on your next purchase of this wonderful vegetable, bring your magnifying glass. I grow eggplant and have always found that if you pick it young, it will not be bitter. Most cooks that I know use it for making the classic eggplant parmigiana, but that too is subject to lots of interpretation. Eggplant straight out of the garden is firm and shiny, not shriveled- looking or spongy to the touch, which is often the case when choosing it in the supermarket. When I do have to buy it in the supermarket, I always ask the produce manager if he or she can open a new crate. My favorite way to use them is to stuff them or use them to make marinated eggplant in olive oil (see recipe on www.ciaoitalia.com) or classic caponata (see recipe www.ciaoitalia.com). 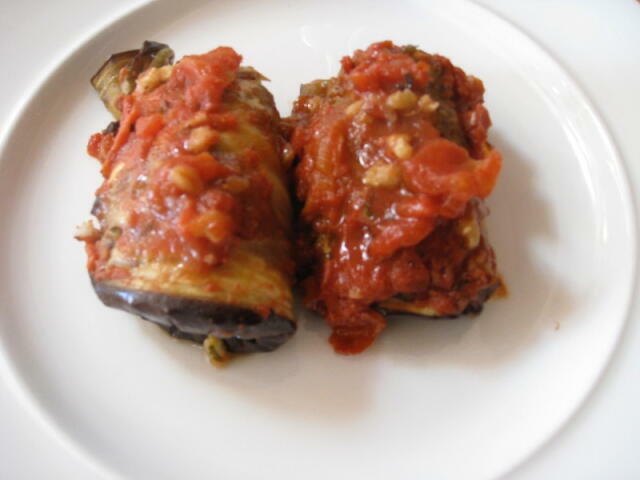 So to make stuffed eggplant, get medium size eggplant and cut it into 8 length wise, 1/4 inch thick slices and sauté’ them very quickly in a little olive oil just until they are wilted looking and taking on a little brown color. Then let them cool while you make up your favorite meatball mixture. I use a pound of ground beef but pork or veal is good too. Divide and spread the mixture on each slice of eggplant. Roll up each slice on itself to encase the meat. Place them in a casserole and pour 2 cups of tomato sauce over them. Add some grated cheese over the top. Cover with foil and bake in a 350F pre-heated oven for 30-35 minutes.